Preserving flowers is often necessary to keep flowers from special occasions or even just to lengthen the life of flowers so you can enjoy them all year long. You can also use dried flowers in craft projects or to make scented sachets--herbs and flowers placed in small bags or pillows. Preserving dried flowers is a simple process, requiring only time, a place to hang your flower bouquet and the patience to wait until your dried flowers are finishing drying. Gather the group of flowers together by their stems. Cut a piece of twine or string long enough to wrap around the flower stems with enough string remaining from which to hang the bouquet. Tie the stems together with a piece of string. Hang the tied flowers in a dark, dry location such as an attic, closet or pantry. Tie the end of the string on the flower stems to a secure location where the flowers can remain suspended. Air dry the flowers. Drying flowers can take two weeks or more depending on the moisture in the flowers. It will be obvious when the flowers have dried as they will appear more condensed and will feel harder when touched. Place your dried flowers in a vase or other vessel to use as a decoration. 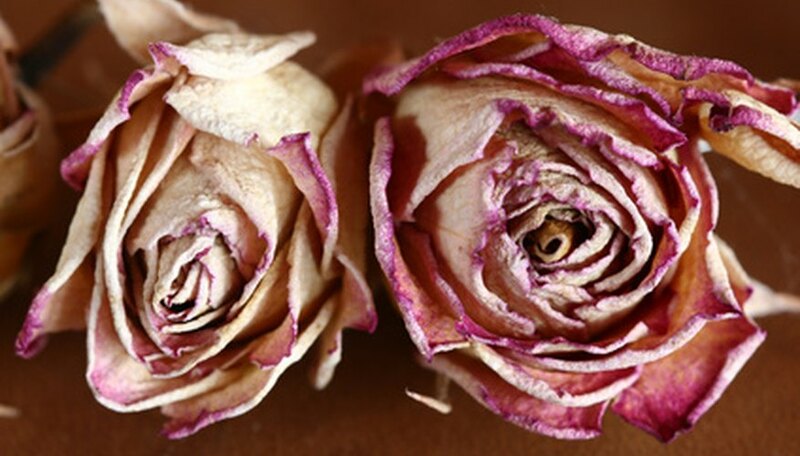 You will need to handle dried flowers with care as dried pieces of the flowers can easily fall apart. Store dried flowers wrapped in paper in a closed box that has a few small holes--use the tips of scissors to poke a few small holes throughout the top, sides or bottom of the box. Choose a drying location with low humidity--basements or garages will add moisture to the flowers and will prevent them from drying properly. Keep dried flowers away from direct sunlight. Shoeboxes are a good option for storing dried flowers. Sommer Leigh has produced home, garden, family and health content since 1997 for such nationally known publications as "Better Homes and Gardens," "Ladies' Home Journal," "Midwest Living," "Healthy Kids" and "American Baby." Leigh also owns a Web-consulting business and writes for several Internet publications. She has a Bachelor of Science in information technology and Web management from the University of Phoenix.